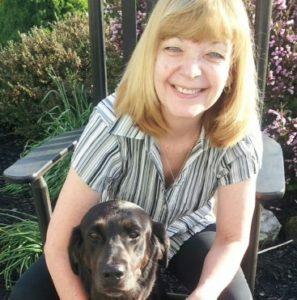 Hello – I’m Kathy Shumway Lawton and I am the owner of K-10 Dog Training in Mexico NY. I really cannot remember a time in my life without dogs. My first recollection of a family dog was Fritz, a hound mix that hunted with my Dad and brothers. She was often borrowed by other hunters because of her game-scenting ability. When my brothers went off to college, subsequent “hunting” dogs became family pets for my sister and me. We had a Springer Spaniel named Corky who was more interested in chasing butterflies than flushing game birds. Later we had two Beagles, Punch and Judy, whose “jobs” was to sit pretty, beg for treats and sleep on the couch. I currently have a rather eclectic family of dogs who were all adopted in one form or another. In the Fall of 2007, I fostered Ellie, a lab mix, from the Humane Society. After three months of foster care, Ellie was officially adopted. She and I are now Pet Partners – her job is to make people in hospitals and nursing homes happy. In 2009, I adopted Truman, a 5 ½ year old Shar Pei/American bulldog mix whose owner could no longer keep him. He was initially more comfortable with men until he and I together completed the Karen Pryor Academy. Now he is my best friend forever. In 2010, I fostered Karmen, a three-year-old puppy mill cocker spaniel. Like many puppy mill dogs, Karmen did not bond with people. However, she soon developed a strong attachment to my former boxer mix Brandie who sadly passed away in May, 2016. Realizing that I could not separate Karmen from her newfound companion I officially adopted her into the family. The final addition to my canine family is Strut (or Strutter-Butter) who is reportedly a hound / lab /terrier mix. He joined the family in 2015. He and I were introduced to nose-work in the Fall of 2016 and we now look forward to weekly classes. I also fosters for Operation Delta Dog in Massachusetts, a nonprofit organization which rescues dogs and trains them to be service dogs for veterans suffering from Traumatic Brain Injury, Post-Traumatic Stress Disorder and related challenges. Many dogs rescued from shelters are heartworm positive or have other diseases If these dogs reside outside Massachusetts, they need to be treated before they can go through quarantine to enter Massachusetts. I foster selected dogs rescued from New York State until they qualify to pass quarantine and are ready to start their new training and eventual jobs. To date, I have fostered Jerry (now McQuire), Marvin and Tippy. My current journey started in 2007 after being laid off and needing something to fill my time. 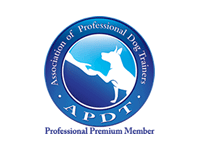 I first took an online dog training class through the Animal Behavior College. I started teaching classes at a local pet grooming shop and found I really like it. 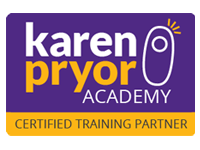 However, with the adoption of Karmen, I realized I needed more knowledge and that subsequently prompted me to apply to the Karen Pryor Academy (KPA) in 2011. In 2014, we converted our garage into a training studio which is where I currently hold my group and individual classes. 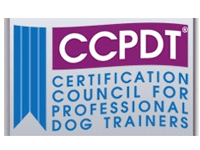 I became an American Kennel Club (AKC) Canine Good Citizen (CGC) Evaluator and I hold prep-classes and evaluation on an as-needed basis. I teach beginner and advanced clicker and manners classes as well. Since early socialization is a prime focus, I teach Puppy classes and will soon be offering the AKC S.T.A.R. Puppy program. I also love working one-on-one with clients and their pets, focusing on resolving specific issues and sometimes re-building broken bonds and trust. KPA spurred a true desire to learn more about our canine friends and how they really learn. I needed to know more of the science behind it. Since I was and am working full-time, I could only train and study part time. But I eventually build up my hours and applied to take the CPDT-KA test. I proudly passed that in March 2017. My current course of study is canine behavior so I can focus more on behavior modification. I currently work full time as the Manager of Business Application for Laboratory Alliance of Central NY, LLC, a medical lab in Syracuse, NY. I have a Bachelor’s Degree in Computer Science and an MBA, both through SUNY Oswego.